Sharing with you everyday adventures, travel stories and my personal journey. What am I going to do? What am I going to do? What am I going to do? I thought to myself while going stir crazy in my hotel room (they are still working out paperwork to arrange our flats). So, I texted Flowergirl and asked if she fancied going out and about, thankfully she did. After recharging with a surge of caffeine Flowergirl and I set out to hunt down the mysteriously hidden massive Lenin Statue. 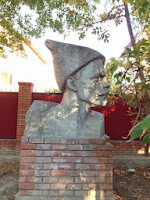 We knew the general direction and had a somewhat decent description of where the statue was, it looked to be about a 45 minute walk from the cafe. We set off down Aztyrek Avenue, moseying down to discover whatever it had in store for us, this street happens to have a lot going on. Tons of restaurants and little shops, quite the place to hang around. One of the first things that I noticed was the amount of people out, walking around (that's right! people walk here!) and enjoying their friends and families company. After walking for what seemed like hours, we saw what appeared to be a large pair of feet on top of a stone block. "That must be Lenin!" I exclaimed. 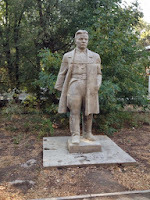 You would think that there would be some sort of special space designated for a statue of his size, not so much. 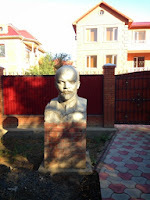 Lenin is situated in a small courtyard on a street with private residences, walking up to the statue, placed just in front of the walls of residences there are busts of Lenin lining the side walk. It was truly a Statue Graveyard, that looks as though no one looks after. Amazing. 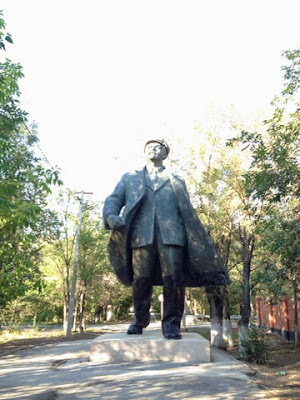 The Lenin statue is absolutely massive and so well done. Truly beautiful sculpting. It was well worth the walk and the adventure. Here are the coordinates to the statue if you are feeling adventurous! Thank you very much! Great to hear from you! Teacher, Coffee Addict, Expat, World Traveler, Blogger, Cat Lady, Fitness Newbie, Food Guru. Canadian living and working abroad, writing about everyday adventures! Living in Kuwait: How 'real' is life?